The All Assam University Employees’ Federation (AAUEF) during its 15th biennial conference held at Bodoland University, Kokrajhar on Thursday decided to stage a six-hour strike on May 28, 2018 in protest against non-publication of the 7th Common Pay Committee Report. The six-hour strike, to be held also in protest against non-implementation of the revised pay structure of the non-teaching employees of the State Universities of Assam by the Government of Assam, will include two-hour dharna and four-hour pen down from 11 AM on May 28, 2018. It was also decided during the conference to observe the same six hours’ strike on June 5, 6, 2018 if the report is not published and the pay structure is not implemented within May 28, 2018. The 15th biennial conference of the AAUEF was held at Bodoland University, Kokrajhar. The conference, convened under the chairmanship of Bhabanan Barman, President of AAUEF, discussed various issues of the Federation. Representatives of four State Universities of Assam – Gauhati University, Dibrugarh University, Assam Agriculture University and Bodoland University – attended the conference. 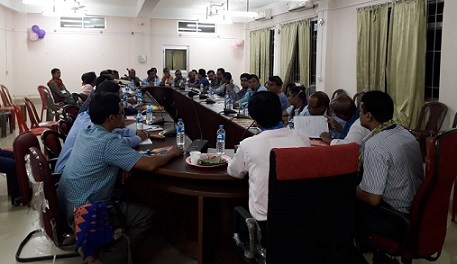 The conference discussed about the 7th Pay Committee’s Report, which was constituted for revision of pay to the non-teaching employees of the State Universities of Assam by the Governor, who is also the Chancellor of the State Universities of Assam. During the conference, the speakers expressed deep resentment and anxiety about non-implementation of the revised pay structure even after elapse of one year from the constitution of the CPC. So the federation decided to stage protest demanding solution to their issue. In the conference, the charge of the AAUEF was handed over to the Bodoland University Employees’ Union for the session 2018-2020. Parag Pratim Saikia was unanimously selected as the President of the federation, who is the junior-most President in the history of AAUEF. Akan Roy was selected as General Secretary while Detsinfa Basumatary was selected as the Treasurer and Rwisumwi Narzary as Assistant Treasurer, who is the first lady member in the history of AAUEF. After taking charge as the President, Saikia thanked all members and promised to work for the betterment of the employees.